The most popular single handed dinghy in the world, the laser is used at all levels of sailing, all the way up to Olympic class but also very popular at grass roots, in sailing clubs up and down the country for people just starting out with sailing. It has three sail sizes; the laser full, laser radial and laser 4.7. The laser has a large worldwide fleet and is incredibly popular, is easy to sail and relatively cheap to buy compared with some of the higher performance dinghies available. I can't agree with these reviews - I loved my Laser! Ok, it's massively over-powered unless you're eighteen stone of muscle, so I spent a lot of time in the water, but it was worth it for the G-forces when things went right. The laser has a lot of irritating features. The sail controls don't lead to where you can operate them, the mainsheet is keen to hook up un the corner of the transom when gybing, the mainsheet horse (such as it is!) saws the tiller in half. The side decks are so wide that once I'm hiked all the way it's a job to get back in the boat. There isn't a proper bearing surface under the mast foot, so given time the mast grinds its way through the step and into the hull. The weird excuse for a self-bailer is easy to damage. 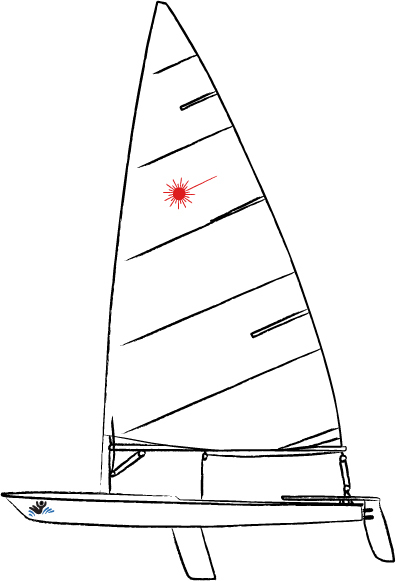 The rudder area is a bit skimpy (loses it's grip downwind in a blow), and because it's a strict one design, you aren't allowed to fix any of the problems. If you aren't the ideal size and weight for the boat there isn't any way you can adapt your boat to suit your physique. The only option is to change to a different rig (in effect a different class). A lot of the boat's features (sleeve luff dacron sail, two piece aluminium mast, polyester resin (I suppose?) hull, are looking very last-century now, when newer designs and classes that have updated their rules are using laminated sails, carbon spars and epoxy hulls. At first I struggled with the Laser 1 - after the only single handed boat I'd sailed was a Topper, I found the Laser too big initially. I also struggled with catching the mainsheet over the back corner through tacks. After sailing one in Greece for a few days though, I got much more comfy in a Laser, although I wouldn't like to sail one in a blow!